Goal: “To improve my skill as a supervisor.” Something is missing, let’s make it measurable too. Goal: “To improve my skill as a supervisor by reading two books on effective supervision and attending three short courses (workshops) and one university or college course.” Is this an achievable and realistic goal? It may be depending on the resources available to pay for the courses and time allowed for completion. Let’s try it again. Goal: “To improve my skill as a supervisor by reading two books (purchased at my own expense) on effective supervision and successfully completing 2 short courses (workshops) or one university or college course (sponsored by my employer)” Now, that’s a bit more realistic. Now, how about a timeline to wrap up our SMART goal? Note that reformatting the goal makes it more readable and also will help with monitoring completion in the months ahead. 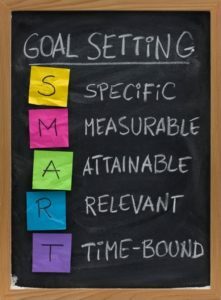 Remember that SMART goals are not written in stone, just on paper! You may negotiate changes to any aspect of the goal with your team or employer as the year progresses. Complex or multi-step goals may have longer timelines and may also require sub-goals (objectives) and action plans (who, will do what, by when). This is especially true when accomplishing the goal involves several people. Paula J. MacLean is the best-selling author of five books focused on human resource management and working with nonprofit boards of directors. For more information, visit www.silvercreekpress.ca.